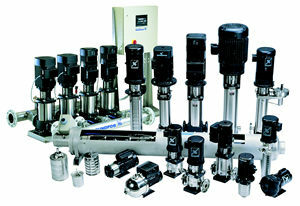 Motor Grundfos provides many motor solutions depending upon the application and demand. In addition, Grundfos makes its own motors to ensure maximum performance. The ML motors* are remarkably quiet and highly efficient. They are also available in the self-regulating MLE configuration, featuring an integrated variable frequency drive. Cartridge seal The specially designed cartridge seal increases reliability, ensures safe handling and enables easy service and access. Shaft seal solutions The cartridge shaft seal configuration comes in a wide choice of materials. It is available in flushed seal and double seal configurations and can handle temperatures from -40F to +356F (-40C to +180C). Connection options The Grundfos CR can be connected to any piping system. Dry-running sensor The patented Grundfos LiqTec system eliminates the risk of breakdowns due to dry running. If there is no liquid in the pump, the LiqTec will immediately stop it. High-performance hydraulics Pump efficiency is maximized by state-of-the-art hydraulic design and carefully crafted production technology. Durable bearings The CR bearings are remarkably long-lived thanks to hardwearing materials and a wide range of options for difficult liquids. Material options The CR is available in four different materials: AISI 304/cast iron, stainless steel AISI 304, stainless steel AISI 316, and titanium. Wide range of sizes The CR comes in 11 hydraulic sizes and hundreds of pressure sizes, ensuring that you can always find exactly the right pump for the job.